More than one-third of Twitter users have lost trust in news shared on the popular social network, according to a new study by Comparitech. The research, which sought to gauge trust and interaction between Twitter and its users, also found that nearly one in five Twitter users say they’ll probably quit within a year. Between June 23 and 29, 2018, Comparitech surveyed more than 400 Twitter users who’ve used the service for at least two years. Respondents were about evenly split between men and women as well as between US and UK nationalities. We used Google Surveys to conduct the study. The timing of the survey came on the heels of Twitter’s decision to suspend 70 million accounts in a crackdown on malicious activity, including spam and trolling. 36% of Twitter users are less likely to believe news they see shared on the platform now than they were two years ago. 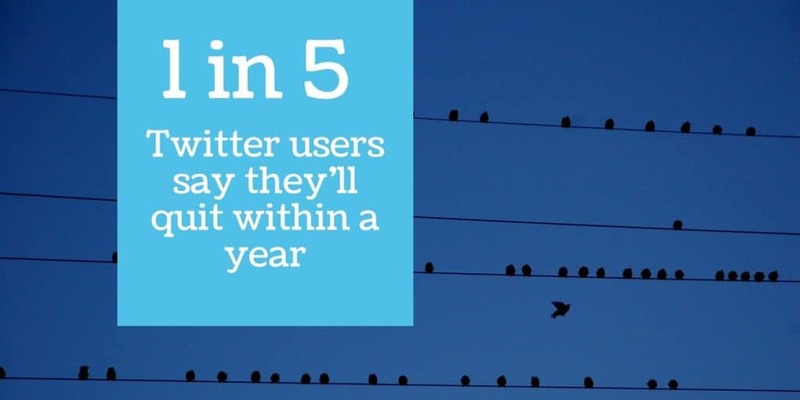 Nearly one in five Twitter users said they are unlikely to still be using the service one year from now. 29% answered “50/50”, while 50.6% said they would likely still be using the service. The specter of a 20 percent reduction in users in a year seems alarming, but it’s worth noting that Twitter already has a poor retention rate. According to an interview with Twitter CFO Ned Segal in late 2017, one-third of Twitter users abandon it every year. However, most of those accounts Segal mentioned are brand new, while the users in our study all confirmed they have been on Twitter for at least two years, so we can reasonably assume the retention rate among survey respondents is higher. Only 12.4% of respondents said Twitter has influenced their political views. Even though trust in Twitter seems to be declining, few admit to being influenced by it, and many are on the verge of quitting, Twitter is still a source of news for many users. 71% of respondents say they use Twitter to stay up-to-date on news “regularly” (31.4%) or “sometimes” (39.5%). British men were the most likely to regularly use Twitter to keep up with the news (40.0%), and American women were the least likely (22.1%). From the survey results, we can see that most Twitter users use the social network to stay up to date with the news, but their trust in that news is waning. We can hypothesize that as trust declines, users will have less of a reason to keep using Twitter and some will quit. Whether respondents will actually follow through on their plans to quit–and whether we can extrapolate their answers to the rest of the population–remains to be seen. Twitter has 335 million monthly active users, down 1 million from the previous quarter according to its Q2 2018 earnings report. Due to banning more accounts, it expects that number will fall further next quarter. Sam Cook contributed to this article.